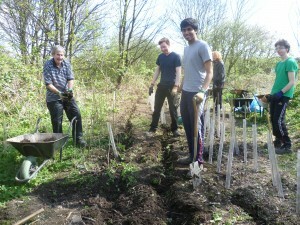 Practical Conservation Volunteering: Help out on the nature reserve and Centre garden, with tasks such as planting, path building, and tree work. Conservation sessions run every Tuesday and Thursday, 9:30am-4:00pm. Wildwatch Group: Join the wildwatchers observing wildlife and carrying out surveys, along with aiding in public education and project development. The group meets every Wednesday, 10:00am-12:30pm. Student Action Volunteering: These sessions are designed for university students who would like to help with wildlife surveying and gain practical conservation experience. Activities take place Wednesdays during term time, 2:30pm-4:30pm. Greening up Heworth Holme: Help restore the wetland meadow at Heworth Holme every Friday, 10:00am-1:00pm (Bad Bargain/Tang Hall Lane entrance). We will be cutting the grass using scythes, sowing wildflowers and installing a path in order to improve the area for it’s biodiversity and those who use the site. Events and Outreach Volunteering: Help organise, publicise and co-ordinate St Nicks events, on and off site though delivering leaflets, helping with events on the day, marketing and fundraising or assist in raising the profile of St Nicks at external events. View our Events page to see what St Nicks have planned for the coming weeks and please get in touch if you would like to get involved. Eco Active days: Come and join us on the second Saturday of every month, 10:00am-1:00pm as we carry out a practical conservation task on the nature reserve. The task will change each month but will focus on maintaining and improving the nature reserve for the wildlife and people that use it. Have a look on our Events page to find out when the next one will be held and what the task will be. So, with whatever time or experience you have, why not get in touch with our Volunteer Co-ordinator, Maria Gill, to find out more?